Back Issues is back to launch The A.V. Club’s annual Comics Week, tackling Alan Moore and Dave Gibbon’s seminal superhero title Watchmen and the controversial prequels recently released by DC Comics. The 1986 series changed the face of superhero comics forever, showing the dark side of the costumed crusader lifestyle in a story that addressed real-world political issues and deeper philosophical questions regarding power, mortality, and sexuality. This is all contained within one of the most sophisticated storytelling structures in comic books, which experiments with a nine-panel grid to show the vast potential of the medium. While the prequels were much maligned by fans, Back Issues will look at the ways the miniseries both enhance and muddle the source material. A different partner will join Oliver Sava each week, discussing three issues of the dense original series along with the Before Watchmen collection covering two prequel miniseries. 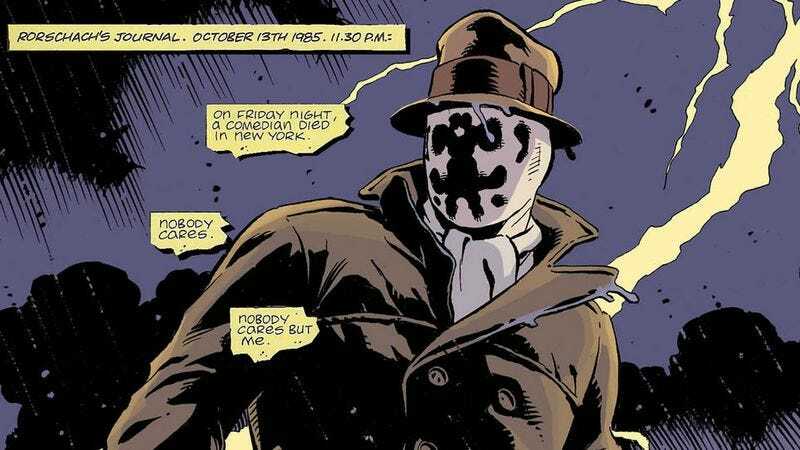 The exploration begins with Genevieve Koski breaking down Watchmen #1-3 and Before Watchmen: Minutemen/Silk Spectre, followed byJason Heller on #4-6 and Before Watchmen: Comedian/Rorschach, Todd VanDerWerff on #7-9 and Before Watchmen: Nite Owl/Dr. Manhattan, and Andrea Battleground on #10-12 and Before Watchmen: Ozymandias/Crimson Corsair. Join the discussion on July 15, when Oliver and Genevieve dive headfirst into Watchmen’s bloody sidewalk.